Unconfident with technology? Here’s how to get the most out of your devices. This guide is for anyone who wants to get a little more tech-savvy, whether you use digital cameras and desktop computers or the latest wireless devices. "How well are you currently incorporating technology into your daily environment?" What device should we choose? Storypark is designed to work alongside your practice so you don’t have to have iPads and WiFi... you can use digital cameras and computers. Having said this there are time-saving advantages to using wireless devices during contact time, including in-camera editing, immediate uploading, wirelessly sharing/printing and cloud storage, so if your service has an allowance for tech purchases, or your old devices are becoming inefficient or taking poor quality photos, investing in a few, shared, high quality wireless devices such as iPads can save time and frustration. For more information on what and how to photograph, check out our guide on Taking great photos, videos and notes. Here are some tips if you use a digital camera to take photos/videos and manually transfer them to a computer. If you use an iPad or other mobile device then please go to the next section. Change your camera’s quality settings. The higher the file size and quality, the fewer images and videos can fit on your camera and the longer they'll take to upload to Storypark. Selecting ‘Medium quality JPG’ will give you a very similar result as ‘High quality JPG’ and will save you storage space and time managing your files. Likewise, a 720pHD video size will look the same in Storypark as a 1080pHD video at less than half the file size. It may take some experimentation but after reviewing a few sets of photos and videos you should be able to find a balance between quality and file size. Your camera should be accessible and ready at all times. This means having a dedicated place (up high!) where it lives, and having a system to make sure the lens is clean and it gets charged each day. There’s nothing worse than seeing a great learning moment and being unable to find your camera, or picking it up and it’s out of batteries, or reviewing your photos later to find they’re hazy from little fingerprints on the lens. Choose a memory card with a large capacity. An hour of HD video can be 10GB so if you’re taking a lot of video you’ll need (at least) a 16GB memory card. Large capacity memory cards can be expensive though so before investing in these, think about whether it may be more beneficial to upgrade the device itself. Transfer your images from your cameras to your computer regularly. We recommend someone doing this at the end of each day, otherwise your memory card will fill up fast and you may not have the images available on your computer when creating stories. Learn more about file types and size limits you can upload. Mobile devices have come a long way in the last few years. They’re now at a point where they can compete in image quality with regular cameras. And they're more flexible and efficient than regular cameras in just about every other way. 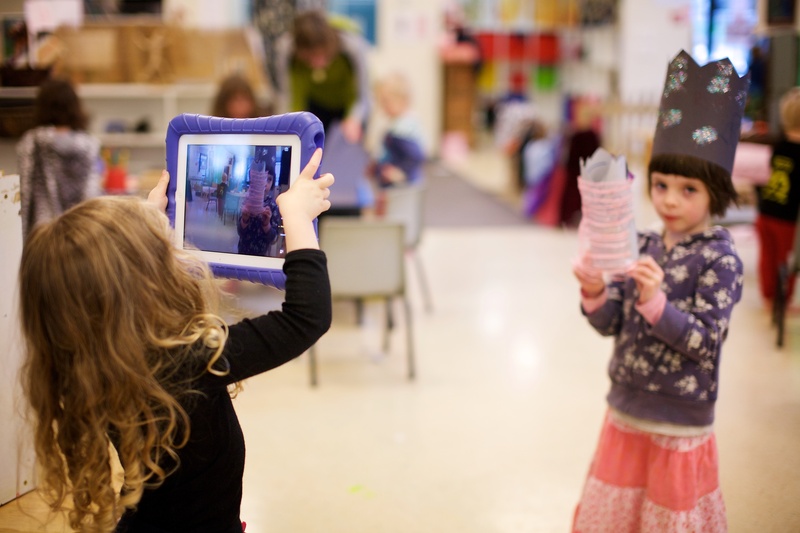 Whereas computers are generally limited to the office, iPads and tablets can be used while with children. Here are a few tips for getting the most out of your wifi-connected device. Give it some protection. Children can be a little harder on gear than adults so investing in a protective case for your device will give you confidence to use them around children. There are plenty of cases out there that offer a stand, handles, water/dust/shock resistance and screen protection. Change your device’s video quality settings. The higher the quality, the fewer videos can fit on your device. There really is no need to have the highest quality setting. All devices are different but if there's an option to choose between 720pHD and 1080pHD, we recommend selecting 720pHD. Videos with this setting will look great in Storypark at less than half the file size. Keep your device accessible and ready. This means having a dedicated place (up high!) where it lives and having a system to make sure the lens is clean and it gets charged at the end of each day. There’s nothing worse than seeing a great learning moment and being unable to find your device, or picking it up to find it needs charging, or reviewing your photos later to find they’re hazy from little fingerprints on the lens. Transfer your images regularly or automatically. If transferring manually via a cable we recommend someone doing this at the end of each day. Alternatively use a cloud service (eg. Google photos) to automatically upload your images and videos to your account. Edit your images and videos in-camera. Most default camera apps allow you to crop, rotate and brighten photos, as well as trim the beginning and end of videos. We discuss additional things that third party apps can offer further on in this guide. Upload images and videos to stories immediately. Many teachers believe that it takes too much time to create regular updates for families and that they only have time for less frequent learning stories. Other teachers have told us that once they got into the habit of posting regular daily snippets, videos and child’s voices, they got pretty efficient at it. It gives families the opportunity to provide feedback daily, which can then be incorporated into richer learning stories. Share images and videos between devices. Tools such as Apple Airdrop or Android Beam allow you to share media wirelessly between tablets. This makes it a little easier for team members to work with one another across shared devices. Print wirelessly. If your printer has wireless functionality you can use Airprint (iOS) or Google Cloud (Android) to print directly from your device. This means you can print photos for a daily wall display as you go, or to display at pickup time for parents who don’t have internet access at home. Storypark tip: Whatever device you’re using, whether it’s a tablet, mobile, laptop or desktop computer, always keep your operating system and browser updated to the latest version. You can set your device to do this automatically. After a while, the makers of these devices and services stop supporting older systems which means platforms such as Storypark won’t work so well anymore. If you’re having issues, this is always one of the first things to try. Image formats we support: JPG (or JPEG), PNG or GIF. You can also upload PDFs. There are no size limits for images and PDFs. Video formats we support: MOV, MP4, AVI or WMV. The file size must be 300MB or less. Keep videos short. Keeping your videos under 3 minutes will generally keep them below the 300MB upload limit. It’s all about balancing quality assessment and the time it takes to upload. You can change the settings on most mobile devices so your videos take up less storage space. A 1-minute 720pHD video takes roughly 60MB of space whereas the same video at 1080pHD video takes 130MB of space. That will make a big difference when it comes to uploading it to a story. Some teachers create stories as PDFs and upload them to Storypark so they can produce them in their existing programmes and make them look exactly like they want. While this has the advantage of offering more editing options it has a few disadvantages. They take more time to produce, they can’t be edited, you can’t include a video, they are unreadable on mobile screens, those with visual impairments can’t use a text reader, families can’t produce a photo book, and they won’t show up in the search feature. So if you can, we always recommend creating your story within the story editor itself. “We used to create stories with ComicLife but now prefer the simplicity of Storypark to focus on the learning rather than the aesthetic”. To save storage space, review your photos and videos regularly and delete what you don’t need. Whether you transfer your media to your computer manually via a cable or you upload to a cloud storage service, agree as a team a filing structure so you can find what you’re looking for efficiently. Whether you choose to set up your folders by child, teacher, date or type of story it helps if everyone is on the same page. You can mark any image/video files that you’ve added to stories – you could add something to their filename, give them a coloured label, add a file description, or move them to a sub-folder. Google Chrome as browser. Whether you’re on a computer or a tablet, we recommend using Google Chrome. It’s stable, automatically updates, behaves the same on Windows and Macs, works effectively with our software, and it’s free. See what other browsers we support. Spell/grammar check apps. Everyone makes mistakes. Some browsers have built in spelling/grammar checkers, however if not you can add a free extension to your browser such as Grammarly. Video editing apps. Your default camera app may allow you to trim/shorten your videos but if you wish to do a little more there are also a number of third party apps such as Google photos, iMovie or Windows Movie Maker that let you rotate, crop and annotate your videos. Some even let you create mini-movies. Learn more about editing apps on iOS and Android. Cloud storage and sharing services. Using an online/cloud storage solution gives you a lot of flexibility. There are a number of free options, and others where you pay a monthly or yearly subscription. Services such as Google Drive, Dropbox or iCloud store your files in the cloud so there's no need to back them up and your team can access everything regardless of where they are and what device they’re using. Files can be uploaded wirelessly to these services directly and automatically from your device. You can even use services such as Google Docs as a shared notepad that your whole team can access and add to throughout the day so you have one place to draw on when you create group or daily stories. If your internet is running slow or you’re having trouble connecting, it may be time to to upgrade. Here are a few things to look for. A connection plan with fast upload speeds. Most connections are advertised primarily by their download speed, which is good for streaming videos, but with Storypark you’ll be creating and uploading a lot of your own content. The faster your connection’s upload speed, the faster videos will upload, which means less time waiting and more time sharing rich media with families. When discussing data plans with a provider ask which plan is right for you and which is available in your area. A Fibre connection is the fastest, followed by VDSL, followed by ADSL2. Use good wireless access points. Wireless is an amazing technology, but it can also be frustrating when it’s not operating properly. Spending a little more money upfront can give you better range, meaning you don’t need so many access points. New wifi access points should be 802.11ac as opposed to 802.11n (‘ac’ operates on a different frequency and gives better speeds and stability if there's a lot of other devices nearby). Check when you install them that you’re able to connect with good signal everywhere you’d expect to within your service, including outside if that’s important to you. Trouble connecting? Try turning your modem off and on again or read this article. If you’re having issues with out-of-range areas or dead spots, consider getting a wifi repeater or extender. Make sure you have an appropriate data allowance and connection speed. Below are monthly data usage estimates based on a service with 50 children, an average video size of 60MB and image size of 1MB (text-only data is negligible). Note: these scenarios can vary depending on camera settings and video resolutions. Whatever the experience of your team, it pays to make friends with a local IT support company. They specialise in troubleshooting tech problems, which means less time away from the children trying to diagnose issues yourself. Also, they’ll get a knowledge of how your service has set up your computers and IT gear, so they’ll be more efficient at diagnosing and resolving any issues you might encounter in the future.